My apologies for neglecting you for almost a week. Life has a way of interfering with cooking and of course, writing all about it. However, my short absence was due to some quality time spent with good friends (and visiting a new city) so I was happy to put down the apron for a few days. I visited Chicago for the first time last week…finally! What a lovely city. My husband and I have had a standing invitation to visit our friends for years but silly us, we dawdled about making it happen. After two years of not seeing them, though, it was time. Chicago welcomed us with clear, bright blue skies last Thursday, allowing for my first glimpse of Lake Michigan from our hotel room. But as excited as I was to set foot on the sands of one of the five Great Lakes, this museum buff took advantage of the fair weather and walked to the Art Institute of Chicago. 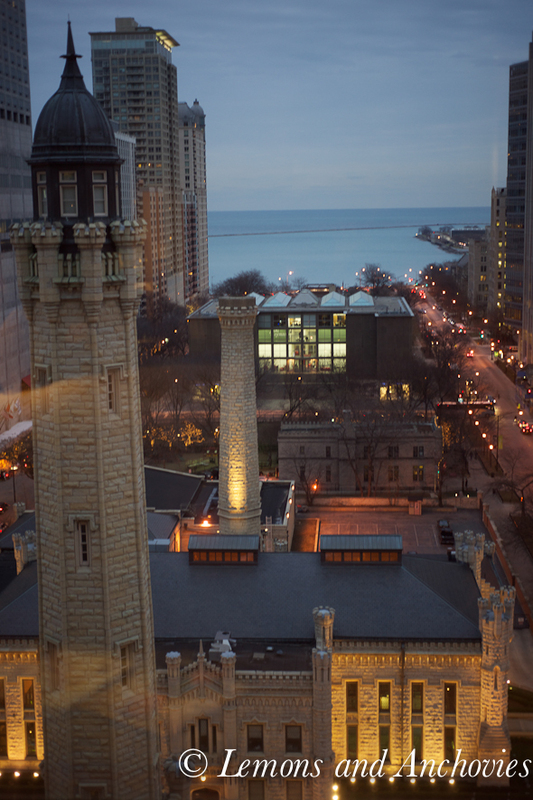 The Art Institute of Chicago houses more than 300,000 works of art ranging from ancient Chinese bronzes to some of the most iconic works of our time. Naturally, an afternoon wasn’t nearly enough time to see and appreciate all the museum had to offer so we focused on some major works and vowed to return to finish the tour. The main purpose of our visit, however, was to celebrate our friend’s birthday. Soon after confirming our visit, Georganne secured reservations at L2O, a popular seafood-centered restaurant in Lincoln Park. How fortuitous that she selected L2O since the restaurant (shortly thereafter) was awarded three Michelin stars, a distinction shared only by the famed Alinea out of all of Chicago’s eateries. Besides the wonderful company our evening was marked by an excellent dining experience. 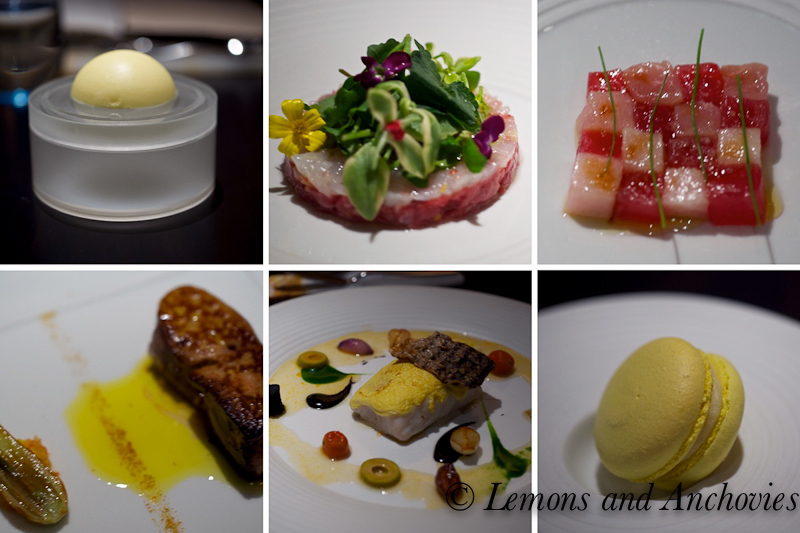 The service at L2O was impeccable and the food simply divine. You may have already gathered from reading my other posts that I don’t frequent Michelin-rated establishments; you will more likely find me at a local hole-in-the-wall or at my neighborhood Italian restaurant, so this meal was quite a treat. We enjoyed a multiple-course meal with a focus on seafood but my foie gras with citrus and fennel and my friend’s lamb tartare with sweet shrimp, tarragon, and pickled mango were among some of the best dishes I’ve ever tasted. And for this anchovy lover, one of the standouts was an amuse-bouche–a mini croissant stuffed with white anchovy wrapped in fresh basil. Outstanding! I highly recommend L2O. We took a stroll along the lake the following morning before the clouds took shape, signaling the arrival of the first snowfall of the season. For more gastronomic delight, we had lunch at Le Colonial, a French-Vietnamese restaurant in Chicago’s Gold Coast Historic District. Again, the food and service were top notch but I skipped the pictures so my friends and I could properly enjoy the meal. The remainder of the trip was spent in our friends’ home and we were treated to delicious home-cooked fare from Georganne and her daughter’s excellent chocolate dessert. Pair this with the snowfall that finally arrived, the company of great friends, a warm and cozy home and three lovable dogs, we had a wonderful time. Since I haven’t had a chance to cook a proper meal since returning home, I thought I’d share with you one of my favorite starters. Gorgonzola and honey are the stars of this crostino–so simple and yet so good. The only caveat is that you must like gorgonzola. Yes, this Italian blue cheese is quite moldy and strong-flavored but this happens to be what I appreciate about it. The cheese is melted on a piece of toast and is drizzled with sweet honey. The contrast of salty and sweet is a winning combination, especially when washed down with a nice glass of red wine. Typically, I would prepare this with a sliced baguette but I had a big rustic loaf which worked just fine. Preheat your oven to 450ºF. Arrange your bread slices on a baking tray and brush tops with a little olive oil. Toast for a few minutes in the oven. 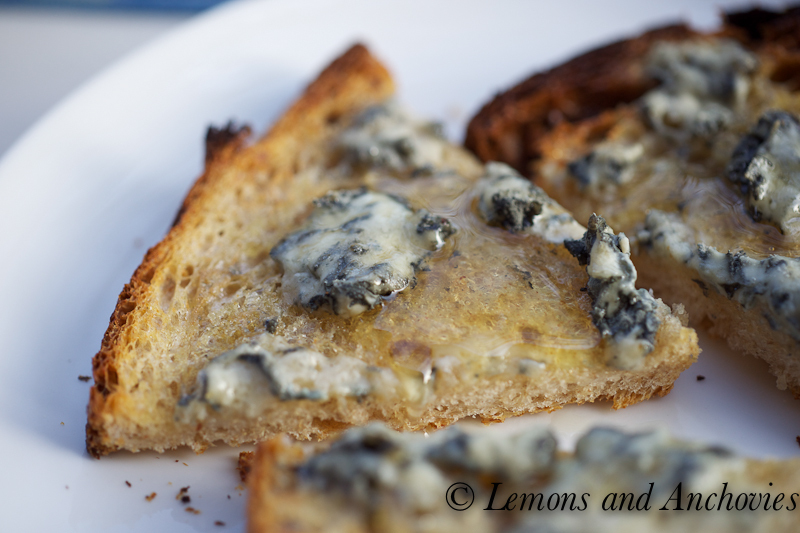 Pull toasts out of the oven and top with as much (or as little) gorgonzola as you like. Return to oven and allow the cheese to melt. Drizzle each piece of toast with a little honey and serve immediately. I was in Chicago about 5 years ago when my sister graduated from the seminary at the University of Chicago. I really enjoyed the city and the eats. And speaking of, that crostini looks devine. Love the combination! I chuckled at Greg’s post – I have a soft spot in my heart for this city – such a great place to fall in love. My food memories of Chicago are so different though, I too, wish I remembered food this good! So glad you had fun and got to spend time at the Art Institute. Seeing the Lake reminds me of such fond, fond memories! We used to live right by Navy Pier! We were in Chicago a month ago and didn’t get to L2O- we did Alinea. It was spectacular and the city was fabulous. Love your recipe- easy and a total treat. I enjoyed reading about your trip to Chicago since this is the city my next-door neighbor is from and she always tells me about it and how great of a city it is and how much she misses it! Oh and I also liked that simple but refined crostini, I love the contrast of pungent and sweet, very clever. It looks like you had a wonderful time in Chicago. That must have been so nice spending quality time with friends you hadn’t seen in so long. My first and only visit to Chicago was just last summer. I’d love to go back because it was also very brief. I love honey and cheese, especially honey and gorgonzola. Yum! 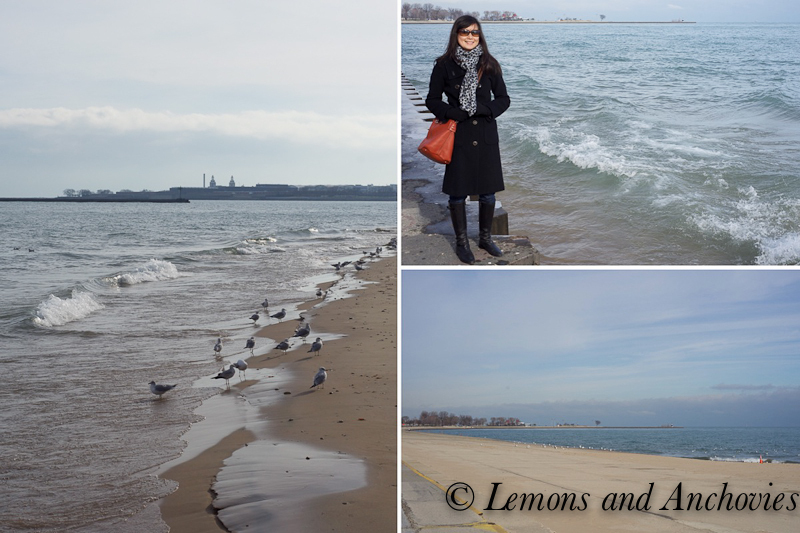 Chicago looks beautiful – but the food at L2O was probably the part that I enjoyed looking at the most! 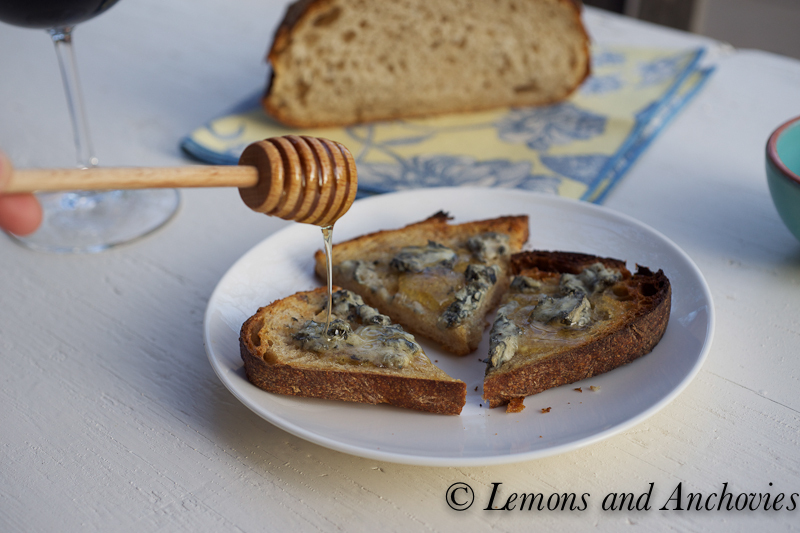 And yes, I do love gorgonzola – never had it with honey but will certainly give it a try. Trissa, I took so many food pictures at L2O, thanks to our gracious friends who allowed me to snap away before they touched their food. It was all delicious! Crostini looks wonderful…I have a fetish for bleu cheese and gingersnap cookies! Great photos of Chi-town! sooo simple, yet so tasty. I love blue cheeses! Chicago is on my bucket list of states to visit – actually I would like to see all 50 . I am about 1/3 to 1/2 the way there. Love the photo of the city you took. How lucky you are to go to a 3 star restuarant – bet is was supreme. Great appetizer – simple yet so delicious! Have a great day!! Isn’t Chicago wonderful? We’re so lucky to be able to be in downtown Chicago in only 90 minutes. We are members of the Art Institute and I recently posted some of the highlights of our last visit in early November. I am making note of L20 for the next time we visit – it sounds wonderful! Susan, yes, Chicago is wonderful. Such a welcoming city. 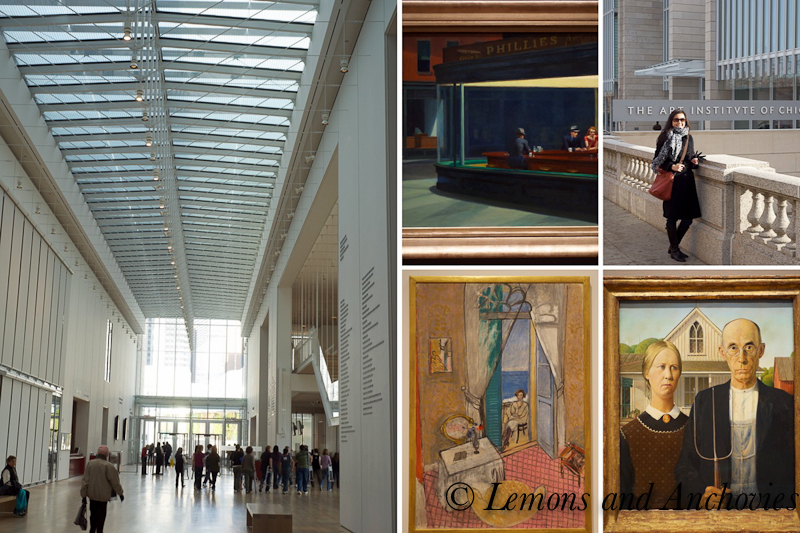 We didn’t see everything we wanted to see at the Art Institute–what a treasure of a museum! It is wonderful you had a great time here. I love chicago :D. The recipe looks great. I also have never been to Chicago so I truly enjoyed all of your photos. Looks a little chilly!! Your last photo of the toast is simply stunning! As I’m a big fan of gorgonzola, I’m thinking this is right up my alley. So glad you had a nice trip! Kind of fun to see the snow, huh? Sounds like you really had a fun trip to Chicago. I love Chicago too. When I visited last year, I did a food walking tour of a neighborhood, and that was really fun. Ohh I’m so jealous of your incredible dinner at L20, Jean! Our friends who live in Chicago have raved to us about that restaurant and I remember them telling us about that checkerboard crudo/sashimi dish. Yum! What a wonderful trip! I’ve only briefly passed through the windy city, but I can’t wait until Ryan and I can take a true long weekend to explore. You looked adorable in your coat, by the way! I really enjoy gorgonzola cheese, but I’ve never tried it with honey before. Thank you so much for sharing, sweet friend. I hope you have a wonderful Thursday! I love Chicago! If I had to choose where to live other than San Francisco it would have to be Chicago! It’s a fun, diverse, cosmopolitan city. And I’ve heard great things about L2O. Thank you for sharing, Jean! And loved the gorgonzola honey toast, too! What a great combination!! I”m so jealous of your trip! we were just talking recently of how we want to visit the windy city, known for their fantastic pizza! Looks like you did a lot of sight seeing while you were there as well 🙂 I really do enjoy Gorgonzola so I think I would also enjoy this toast! So simple and so delicious looking. Aaaaah, the Windy City – born there and briefly moved back later in life and couldn’t take the cold after being in CA for 20 years! BUT it is a fabulous city to visit 🙂 I’m like you, more likely to be found in a local ethnic or hole-in-the-wall restaurant – but L2O certainly is a worthy exception to that rule. Glad you were able to see your friends and enjoy your time in Chi-town. Priscilla, I didn’t know you were from Chicago. I understand about the cold–it wasn’t too bad when we were there but I can imagine wishing for the fair California weather after a time. Great to visit, for sure! Gosh the last time I was int he Windy City was for a wedding and it was frigid. I love foie gras, it looks like you had a fantastic time. I like gorgonzola but only when its paired with something sweet so your delicious treat sounds amazing! Oh, I made your pasta with anchovies and olives with with my modifications and it was yummy! Thank you for sharing this, Jean! I miss Chicago, too, and I think it’s time for another visit. Le Colonial in SF has the same signage as the one in Chicago. I cannot wait to try the latter’s menu! Gosh, I didn’t even know that! Now I’ll have to visit the one in SF. Thanks, Annapet! Gosh, I love Chicago so much. There’s this one little taqueria called Allende where they serve the best tacos in the world. Yum. Plus, there’s all the shopping, too. :-p Can’t ever forget that. i’ve never been to Chicago but I’ve always wanted to visit… after looking at your posts and the food memories that you’ve just made, Chicago is a must see city! Thanks for taking me there with you! Made this Sunday night- it was the perfect snack! I live just 25 miles North of Chicago and I have to say I try to get down there at least once a week. Great food–great people! 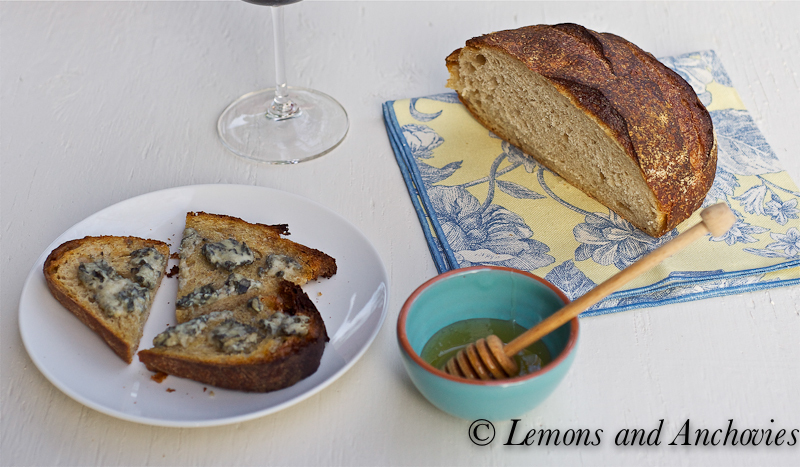 Gorgonzola and honey is a favorite in our house. We also enjoy it with thin slices of Comice pears and make a meal out of it. Yum!